This image for the April page of my calendar was taken on the Campus of Goddard College in Plainfield Vermont on July 23, 2016. I had driven up through Michigan into Canada, stopping by to see fellow Goddard alum Annis Karpenko in Mississauga Canada. I continued driving a little further east before turning south to head toward Goddard for the commencement ceremony that included my friend Brenda Bowyer Farmwald. To make the event even sweeter, several of the Goddard alum from recent years were gathering at a beautiful farm house outside of town for several days. We intended to consider the ways that we might continue the meaningful activities of our joint studies while working toward our Interdisciplinary Arts MFA’s. We agreed that our group “hangs” on Google and the sharing of work and ideas while working in our diverse locations throughout the US, Canada and Europe was a rich and meaningful activity that we wanted to continue. I saw this wire sculpture every residency. I presume (or heard?) that it was created by another alum of some years back. It had always interested me, but never more so than on this trip back to campus where I was keenly aware that I was no longer a student-insider, but someone slightly removed, off-center. I loved being back even as I mourned the loss of the focus and the rich interactions by and with faculty and fellow artists creating and implementing their study plans. Having been raised in the Roman Catholic tradition, this tree form is richly symbolic for me. I was drawn to it, the smooth coiling wires of the trunk becoming gnarled branch and twig. In its bare form I perceived a living being manifesting a cycle of apparent deaths each winter and long-awaited resurrections each spring. No surprise that the power of this life-death symbology is leveraged in just about every spiritual and religious tradition throughout time. 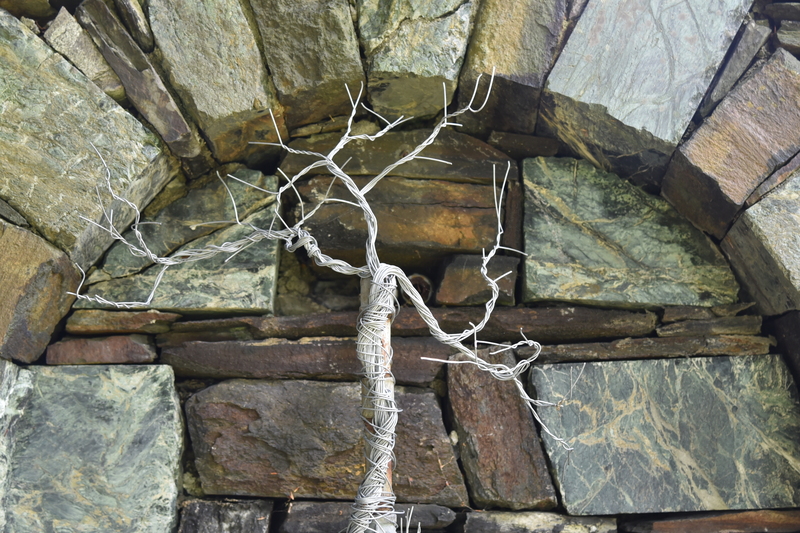 Looking at the wire tree-figure that felt so alive to me, I experienced an ache, a yearning to be back again in the midst of the recurring cycle of our MFA residency. I wanted again to be immersed in each 15 week semester broken down into five three-week periods with “the packet” due at the end of each 3-week period. That had been my ruling cycle for 5 semesters. I still felt rootless without that cycle. Rootless, like I felt leaving Columbia College after 12 years where our administrative lives were so closely tied to the academic calendar, with the grand climax each May with Manifest and three, then six graduation ceremonies over the course of two days – I helped plan them all. I attended them all. Rootless, like I felt after 6 years at the Diocese of Gary in which the liturgical calendar rich with symbol and sacrament was the heartbeat of our work and prayer. Rootless, like I felt when my marriage ended and I left the house in which the rhythms and schedules of kids’ lives, our work lives, our meal times, shower times, chore time and bed times were so inextricably woven for 22 years. So many deaths and resurrections. Understanding the immanence here does not make easier the loss of each little world in which I have travelled for a while. Ironic, because I easily recall how I would chafe at the forms of each world with its cyclical demands, schedules and attendant frustrations. But once the form dissolved in the mist behind me as I walked away, how I missed those very things. So. . . . the tree. It still calls me to attention.